Every girl deserves a bit of luxury, right? So last Friday me and my sister went shopping to have a little bit of retail therapy. We needed to pick up a few things for our mum for Mothers Day, as well as a good old nose around at the bargains. We arrived in town quite early, about 9:30am so we could enjoy shopping when it’s not too busy and chaotic. – It’s the best time to go! Our first port of call was ofcourse LUSH. I think every girl knows how beautiful the smell is in there and at 9:30 in the morning, it was a great way to start out day! It was lovely and quiet and we couldn’t wait for a good look around at all the new scents and different spring products lining the shelves. The LUSH staff always make you feel so welcome and are so passionate about providing amazing customer service. We were greeted by Elen who kindly asked if we needed help, which we did! ….Mother’s Day gifts! We were shown some amazing products that Elen thought would suit our lovely mum (who only takes showers) and tested out the MANY scents and styles. We chose a limited edition shower gel called ‘Yummy Mummy‘ and an exfoliating soap called ‘Buffy‘ – They were perfect for her and both smell beautiful. Now, we couldn’t go in to LUSH and not look around ourselves could we? Kindly, Elen was so happy to help find some products specifically for us and show us the ones suited to our skin and hair types. It was honestly like having a personal shopper, she was so kind and explained all the benefits of the many many products we saw. And here’s the best bit..
We sat down around a beautiful table filled with face masks, body scrubs, toners, cleansers and moisturisers ready to test them all! Every time im here, I just find the presentation of the products outstanding. It creates such an amazing atmosphere for the customer and instantly makes me feel like I’m in a spa! My sister has combination skin, (I have dry skin) so this face mask is perfect for her. It is filled with blueberries, calamine, chamomile, rose and almond oils. It softens and soothes the skin and is great for soothing red patches whilst hydrating the skin and smelling good enough to eat! ﻿ I can honestly say, to be polished and pampered for about an hour in LUSH had to be one of the most relaxing experiences, as well as learning so much beauty-ful information for our skin types from Elen. I left with my delights and could not wait to bring them home to show you beauties as well as giving them a try! In the Spring and Easter spirit, I bought this cute little guy for £2.50, it’s called ‘Hoppity Poppity‘ and has popping candy inside to fill your bath with beautiful bubbles﻿! No these are not edible.. Tempting I know! I picked up ‘A bunch of carrots’ bubble bars. We were shown how the work and they create so many bubbles for your bath and smells heavenly of lemon, bergamot and Buchu. You swish them in your bath water and are reusable so they will last ast such a long time! How amazing are these? I picked up this delicate coconutty slab that was recommended as I have dry hair and a dry scalp. This will nourish and moisturise as well as leaving me smelling like a piña colada! And lastly, When looking at the face masks for dry skin, Elen recommended this rose scented delight. I tested it out and it left my skin feeling so soft and moisturised. It has seaweed, honey, aloe Vera and rose in the mix and is so soothing and smells so sweet and delicate – perfect for my sensitive skin! Our morning was perfect! It was actually really lovely to spend this time with my sister and have a bit of a pamper before heading off for some more delights! What do you think guys? What are your faves from LUSH? 300 followers & 500 bloglovin subscribers! I am so excited! Another milestone! It only seems like yesterday that I did s post about my 200 followers mark! 300! I know it’s not a huge amount but it’s another step further to reaching out and inspiring as many beauty-ful people as possible! Thank you to all my followers, old and new! I also recieved 500 followers on Bloglovin today! And if you havnt seen today’s earlier post about Bloglovin, check it out! Another amazing achievement!! I am so thrilled to speak to you guys every day and love the amazing little community that we all share! 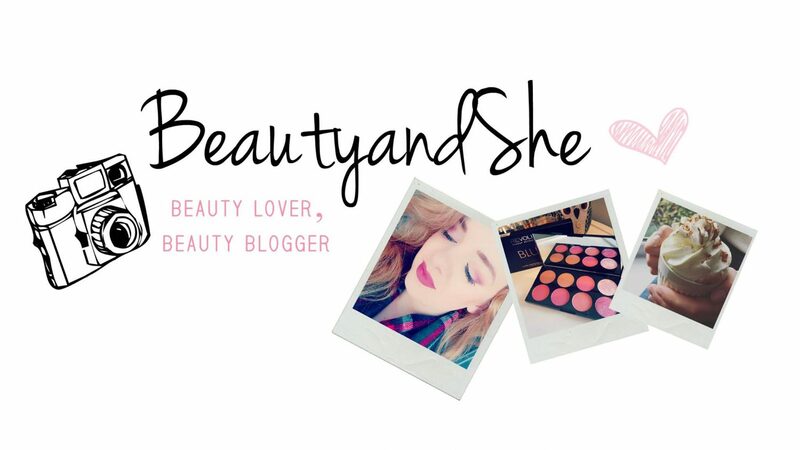 As of today, you will find me at http://www.beautyandshe.com! I felt it was time to step things up a bit and get my own personalised domain name. As much as I enjoyed having my previous web address, .com just seems a bit more professional! If you guys feel like you want a change or want to update your own, you can do so on your wordpress settings! It only costs $18 a year (£12 for us UK girlies). I am really enjoying my blogging life and I cannot wait to see how this helps my blog progress and grow! Let me know if you guys need any more hints and tips about updating!